Vintage Life: We’re Plumb Crazy! I’ve let too much time pass since my last post and in the meantime we’ve just celebrated our one year anniversary of buying our little disaster/bungalow. However, you still aren’t caught up on all of our hard work! After we finished re-wiring the house, the next major project was to re-plumb the whole house. The original cast iron and copper pipes were leaking and rusted in some areas, so we ripped out all of the original pipes during the demolition phase and sold them for scrap metal. We started at the connection to the city’s water line at the street and dug a trench through the front yard. We ran all new PVC/CPVC pipes from the street to under the house. 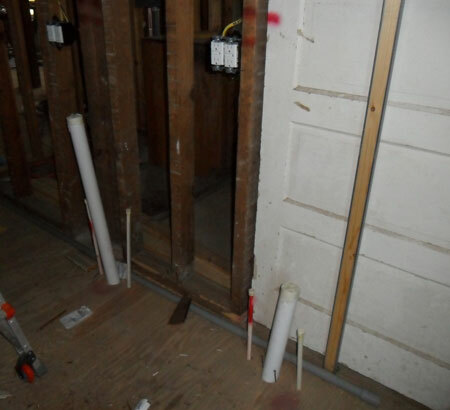 We’ve brought the pipes up through the floor and capped them in the master bathroom. This is where the double-sink vanity will go. And most importantly, we can finally flush! Whew, what a relief. I’ve already shown you the bathroom we built in what used to be the utility room, that will now serve as a guest bath to the guest bedroom that we haven’t built yet on the back of the house. 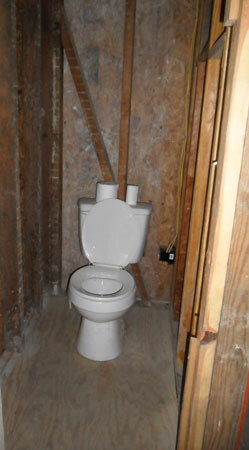 It now has water connections for the toilet, sink, and shower too, although they are not shown in the photo. 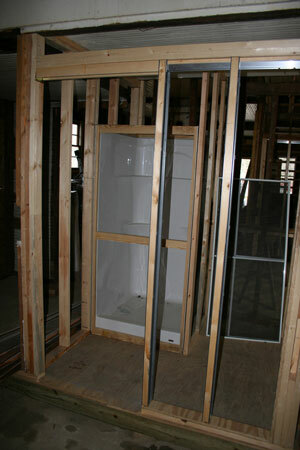 The bathroom in the upstairs loft is also beginning to take shape as we run the plumbing there too. I didn’t take photos, but we also put in a half guest bath off the front room, in part of the area that used to be the central hall. When we purchased the house, it had two bedrooms and one bath. When we’re done (maybe a year from now?! ), it will have 3 bedrooms and 3 and 1/2 baths. How’s that for improving the space?! This entry was posted in Vintage Life: Our 1920s Bungalow and tagged Bungalow Renovation, Plumbing an Old House, Vintage Life on October 29, 2012 by euroluxantiques.